The city is proposing a request-based review system whereby residents flag where playground speed zones may not be necessary. 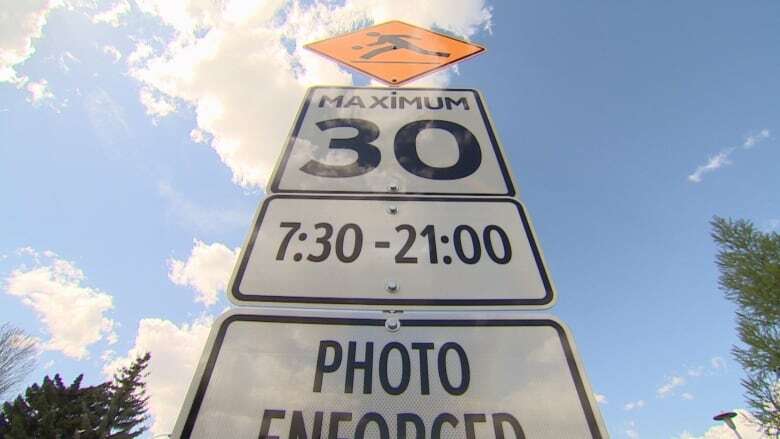 More than 40 per cent of Edmonton's standalone playground speed zones — where motorists must slow to 30 km/h — may not be necessary, according to a review by city staff. A report going to council's community and public services committee Wednesday considers the city's 163 standalone playgrounds — ones that are not connected to schools or school yards. Of the total, 68 fell short of the Alberta government's guidelines for school and playground zones, as well as the city's more strict supplementary guidelines. Based on the review, the speed limit along these 68 stretches of road could be changed from 30 km/h back to 50 km/h, according to the report. Are all playground zones are necessary? After a pilot project in 2014 that found having the lower speed limit at schools led to a marked decrease in collisions and injuries, the city began looking into expanding the strategy. In 2017, 406 playground zones were implemented across Edmonton, dropping the speed limit to 30 km/h between 7:30 a.m. and 9 p.m. The move ignited controversy, with residents wondering why there were so many playground speed zones — and in some cases, so many of them so close together. Coun. Ben Henderson, vice-chair of the community and public services committee, supports the idea of playground zones. But he acknowledged "there are other parts of town that were designed in different ways where the playground zones may not make as much sense." In May of this year, following months of debate, council requested the review of the playground zones. "Not everything's the same. Not everything's identical. And we needed a way to be able to look at those situations," Henderson said. Henderson, who represents Ward 8 on the city's south side, said there's another side to the issue. He has heard from constituents concerned that kids are gathering at places that don't qualify as playground speed zones. "It's not, strictly speaking, a playground, but we need to have some protection," Henderson said. The report to community and public services includes a suggested request-based mechanism that city staff could use to review locations that residents think may or may not need to be playground zones. Administrators suggest people with concerns alert the city through 311 or by contacting the office of a councillor or the mayor. "A one-size-fits-all just doesn't work when our city has been designed at different times and works in different ways," Henderson said. The request-based review system would also look at the Alberta guidelines and the city's supplementary guidelines, assessing factors such as the number of collisions involving children, traffic volume and surrounding land use.